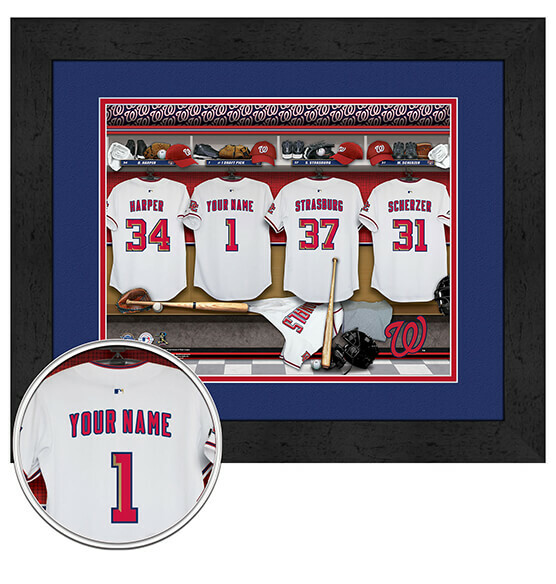 Show your love for Nats baseball with our Washington Nationals Personalized Locker Room Wall Art. Whether you buy this print for yourself or as a gift, this customizable framed art makes a fantastic addition to your Major League Baseball and Nationals fan zone. Just specify the name or nickname you want to add to the back of the jersey in this locker room scene and we will do the rest. It comes ready to hang with a sawtooth hanger for fuss-free decorating. It also features double digital mat inlay in Washington Nationals team colors and a striking black frame.